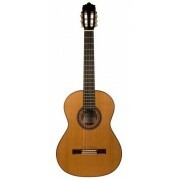 The Prudencio Saez 160 classical guitar is a very distinctive and original guitar. Totally made in Spain with quality woods, the Prudencio Saez 160 is a well balanced guitar for beginners with solid cedar top, Redgum body, Mexican granadillo fingerboard and Mexican granadillo bridge with gloss finish. The action of the guitar is fantastic and the sound is rich with plenty of volume. A very good instrument to start playing guitar with style. This guitar doesn't need CITES permit for export.